What's the time, Mr Gro-clock? What’s the time, Mr Gro-clock? As the mother of an eight-month-old who seems to think that 4:15am is a perfectly acceptable time to start the day, I can truly appreciate the beauty of the Gro-clock. Obviously my daughter is a little too young to understand the genius behind this, but mums of toddlers can teach their kids to know when it’s time to get up and when they should stay in bed just by looking at the simple graphics of this clock. The Gro-clock, priced at £39.99, uses fun images of the sun and the moon to let them know just when it’s acceptable to go bounding out of bed to terrorise parents. The clock comes with a bedtime story book (to encourage more time in bed no doubt), and features include: adjustable screen brightness, optional digital clock and alarm feature, and stars that go out one by one during the night to show the passing of time. Check out the video below to get a true idea of how it all works. Also new to the Australian market is the Kid’Sleep clock, $49.95. Designed to help little ones who are too young to tell the time to know when it is time to sleep and when it is ok to wake up. This should help (fingers crossed!) to stop early morning risers and train them to sleep longer. How does it work? The clock features a picture of happy sheep hiking in the day and sleeping at night. 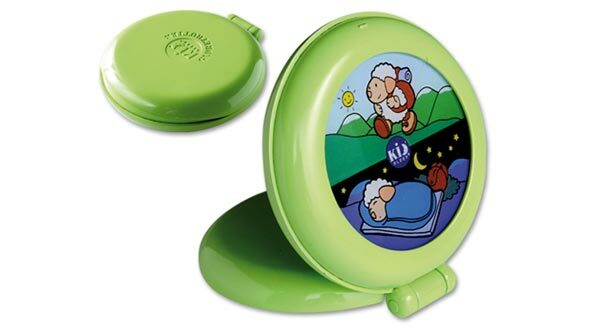 All you have to do is set the clock along with the time you want your child to wake and let them know that they can only get out of bed when the happy sheep are hiking once again. I love it! You can purchase one through Bonito Baby.